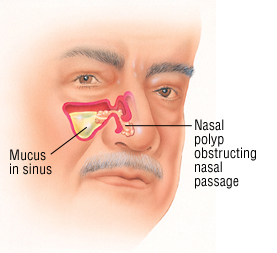 A nasal polyp is a benign (noncancerous) tumor that grows from the lining of the nose or sinuses. These polyps usually occur in both the right and left nasal passages and obstruct the flow of air. They can make your nose feel stuffy, and can decrease your sense of smell. Not all growths in the nose are polyps. Nasal polyps may result from chronic (long-lasting) inflammation of the lining of the nose, although they often occur for no apparent reason. People with chronic hay fever (allergic rhinitis) are more likely than others to develop nasal polyps. In addition, nasal polyps commonly develop in children with cystic fibrosis.